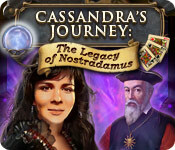 Cassandra's Journey: The Legacy of Nostradamus is rated 3.8 out of 5 by 18. Rated 5 out of 5 by Eveoflove from Absolutely LOVED it! Review based on the completed game in TIMED mode, using Windows 10 without any issue. 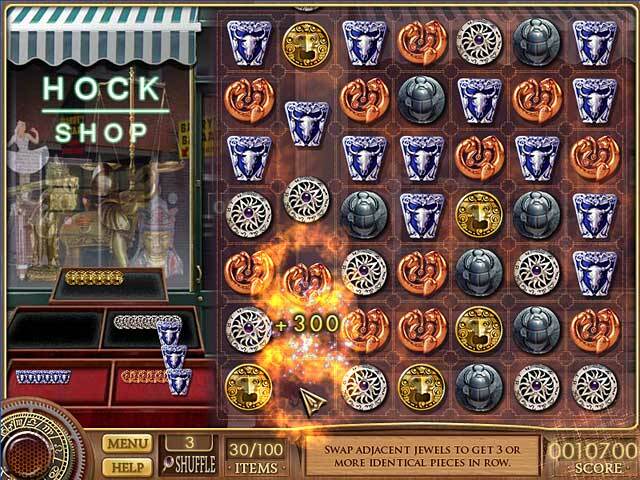 This game is very unique as it consists of 40 levels made up of different types of games: some are hidden object (list, riddles or silhouettes), some are match-3, some are "spot the differences" between 2 or 3 pictures, some are word finds, some are jigsaw, etc. There's a good hint system for the HOG levels as you collect gems to purchase them; I have to admit I only used 1 in the entire game! I played in timed mode and had LOTS of time left on each level: I think the lowest I got still had 5 minutes left. The story is not particularly exciting: you're trying to find a ring, and each level brings you closer to the "solution". The game is easy, relaxing, with diversity of gameplay that might not fit everyone's tastes. It took me a bit over 3 hours from start to finish without rushing thru. It's old school and entertaining. I can't wait to play the sequel! Rated 5 out of 5 by wabtm from Great for a break away There were lots of short games which was great to be able to come to and play and then go away and get back to business. Rated 5 out of 5 by Gojira2006 from I Predict - This is Fun . . . ! 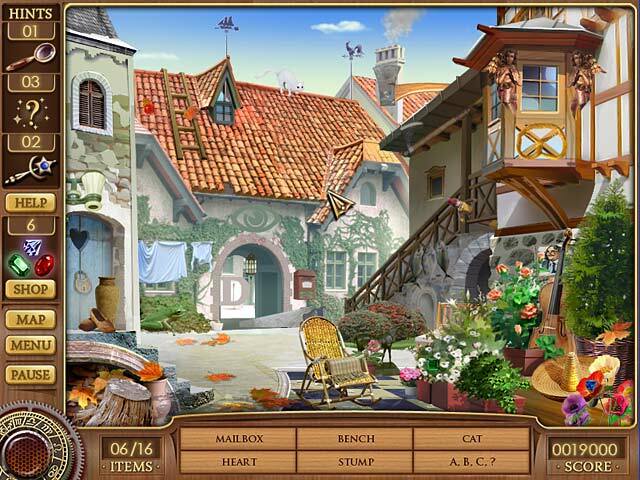 Cool hidden object scenes & moderately difficult puzzles . . . 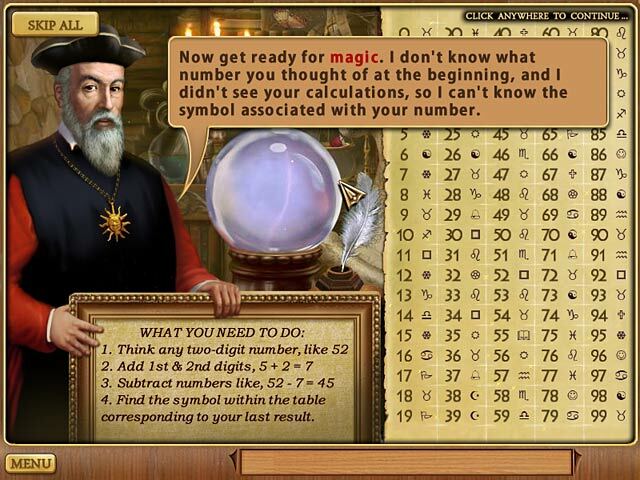 The best part of the game is the numbers tricks you can teach your friends - introduced by the Great Seer himself . . . ! Untimed, with nice graphics, story & characters . . . Rated 4 out of 5 by grandmamaj from Not Just Hidden Object The graphics are nice. The constant dialog is a bit annoying, but overall pretty fun. I have only played the trial version so far but will purchase this game. I like the fact that it includes match three and solitaire. Since I only played the trial there is no telling what else it has. Can't wait to try game 2! Give it a try. If you like really tough games this is not for you. I play for fun and tough isn't fun for me. Rated 4 out of 5 by pennmom36 from Cassandra's Journey: The Legacy of Nostradamus The only complaint I have with this game is the fact that there is a ton of dialog boxes to read, but if you don't care about the story you can always use the skip all button. This is a really well done hidden object game, Cassandra is plunged into the psychic world alone after the death of her Aunt. Her first case is to find a missing person whom nobody else can including the police. She is only an apprentice so she types help into the search engine and voila, the spirit of Nostradamus comes to her aid! To prove his psychic powers he shows us a group of card and tells us to choose any card without clicking on it and our card will be gone when he shuffles the deck. Sure enough whatever card you chose will indeed disappear as well as all the other cards because they have all been replaced with a different suit! There are listed items to find as well as silhouetted shapes. Each level has several gems to collect which can be used to purchase extra hints or time. There are 3 different types of hints, 1-Exact location of the item, this will cost you 6 gems to replace. 2-Highlight of a small area surrounding the item, this will cost you 2 gems to replace. 3-The cursor will radiate brighter as the cursor gets closer to the item, this will cost you 3 gems to replace. You can purchase additional time to add to the timer and this will cost you 12 gems each time. You do have the option of playing this game in timed or untimed modes. Between each HOS is a clever mini game such as a game of solitaire which you need to click on the exact card values, king and king two and two it doesn't matter what the suit is. Nice and relaxing with or without a timer, enjoy! Rated 4 out of 5 by coolang1989 from FUN GAME I really enjoy playing this game. Cassandra loses her magical ring and you must find it in order to help one of her clients find her missing brother. The graphics in this game are nice and clear, appealing music, and the story line was interesting:) The only con I have in this game is that it is too easy. Rated 4 out of 5 by sueandjack from Cassandra's Journey: The Legacy of Nostradamus has a nice RING to it. Good HOG-not real hard but a good fun game for all. Lots of puzzles that were fun and tricky. Good buy @ full price great buy @ a discount. I don't know how anyone could rate less than 3 stars! I recommend this HOG game. Rated 4 out of 5 by LoneCleric from An enjoyable adventure I had been playing a lot of HOGs with little or no story as of late, and so this game turned out to be a big relief for me. I found the story (where you race around town looking for your lost ring, with the ghost of Nostradamus in tow) highly enjoyable. Gameplay-wise, this is what I call a "classic HOG", which means you're being railroaded through a series of hidden-object scenes, with the occasional minigames to spice things up a bit. Rated 4 out of 5 by runninglee from Fun way to spend a rainy afternoon! Not the most challenging or complex game around but good fun!! !